Friends of the Wild Whoopers often receives questions about the status and long-term plans for managing whooping cranes. To provide you with the best answers we have posted a copy of the preface and executive summary of the official International Recovery Plan for the Whooping Crane. If you do not find the information you seek, then you can click on the link provided to see a copy of the entire plan. 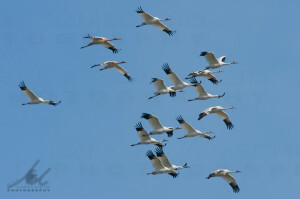 The Whooping Crane Recovery Plan (Plan) was prepared under the authorities of the U.S. Endangered Species Act (ESA) of 1973, as amended, the Canada Wildlife Act of 1974, and the Canadian Species at Risk Act of 2003. Decision-makers are provided with an orderly set of events that, if carried to successful completion, will change the status of this species from the Endangered to the Threatened level. The Plan describes management and research actions that are underway and proposes additional actions needed to ensure the recovery of the whooping crane. Funding levels and time schedules are estimated, and priorities have been set for each management and research action. This revision of the Whooping Crane Recovery Plan describes recovery actions and costs required for the birds and habitat in both Canada and the United States. Part I covers basic biology of the species, historical and present distribution, habitat requirements, numbers and rate of growth, biological factors limiting the population, human threats, and conservation measures. Part II states the recovery goals, strategy, objectives and criteria, provides a step-down outline of specific actions needed for recovery, and describes protective actions to alleviate threats. Part III provides an implementation schedule for recovery. Parts IV and V provide contact information and key references. Appendices C and D, respectively, address recovery actions completed or underway, and summarize responses to public comments on the draft plan. The recovery program for the whooping crane is an excellent example of international cooperation to save a species. Cooperative recovery actions of the 2 nations are outlined in a Memorandum of Understanding on the Conservation of the Whooping Crane approved in 1991 and updated at 5-year intervals. Development of this Plan by a joint Canada/U.S. Recovery Team is appropriate because the whooping crane’s recovery is dependent upon conservation and management of the species in both countries. As an international document, the Plan has a unique format to satisfy the requirements of both Canada and the United States. It was written in conjunction with 2 Canadian documents; National Recovery Strategy for the Whooping Crane (Grus americana) and Action Plan for the Whooping Crane (Johns and Stehn 2005a,b). Current Status and Distribution: In the United States, the whooping crane (Grus americana) was listed as threatened with extinction in 1967 and endangered in 1970 – both listings were “grandfathered” into the Endangered Species Act of 1973. Critical habitat was designated in 1978. In Canada the whooping crane was designated as endangered in 1978 by the Committee on the Status of Endangered Wildlife in Canada (COSEWIC) and listed as endangered under the Species at Risk Act (SARA) in 2003. Critical habitat in Canada is officially designated upon publication of a final SARA Recovery Strategy or Action Plan on the SARA Public Registry. Whooping cranes occur only in North America. They currently exist in the wild at 3 locations and in captivity at 9 sites. The February 2006 total wild population was estimated at 338. This includes: 215 individuals in the only self-sustaining Aransas-Wood Buffalo National Park Population (AWBP) that nests in Wood Buffalo National Park (WBNP) and adjacent areas in Canada and winters in coastal marshes in Texas; 59 captive-raised individuals released in an effort to establish a non-migratory Florida Population (FP) in central Florida; and 64 individuals introduced between 2001 and 2005 that migrate between Wisconsin and Florida in an eastern migratory population (EMP). The last remaining wild bird in the reintroduced Rocky Mountain Population (RMP) died in the spring, 2002. The captive population contained 135 birds in February, 2006, with annual production from the Calgary Zoo (CZ), International Crane Foundation (ICF), Patuxent Wildlife Research Center (PWRC), Species Survival Center (SSC), and the San Antonio Zoo (SAZ). The total population of wild and captive whooping cranes in February, 2006, was 473. The whooping crane breeds, migrates, winters, and forages in a variety of habitats, including coastal marshes and estuaries, inland marshes, lakes, ponds, wet meadows and rivers, and agricultural fields. Historic population declines resulted from habitat destruction, shooting, and displacement by activities of man. Current threats include limited genetics of the population, loss and degradation of migration stopover habitat, construction of additional power lines, degradation of coastal ecosystems, and threat of chemical spills in Texas. The recovery goal is to establish multiple self-sustaining populations of whooping cranes in the wild in North America, allowing initially for reclassification to threatened status and, ultimately, removal from the List of Threatened and Endangered Species (delisting). Populations may be migratory or non-migratory. The wild whooping crane population is characterized by low numbers, slow reproductive potential, and limited genetic diversity. A stochastic, catastrophic event could eliminate the wild, self-sustaining Aransas-Wood Buffalo population (AWBP). Therefore, the recovery strategy involves: protection and enhancement of the breeding, migration, and wintering habitat for the AWBP to allow the wild flock to grow and reach ecological and genetic stability; reintroduction and establishment of self-sustaining wild flocks within the species’ historic range and that are geographically separate from the AWBP to ensure resilience to catastrophic events; and maintenance of a captive breeding flock to protect against extinction. Offspring from the captive breeding population will be released into the wild to establish these populations. Production by released birds and their offspring will ultimately result in selfsustaining wild populations. The continued growth of the AWBP, establishment of additional populations, and maintenance of the captive flock will also address the loss of genetic diversity. This plan sets forth 2 primary objectives and measurable criteria that will allow the species to be reclassified to threatened (downlisted). The numerical population criteria can only be achieved if threats to the species are sufficiently reduced or removed, i.e., the population criteria are a benchmark for threat reduction. Objective 1 – Establish and maintain self-sustaining populations of whooping cranes in the wild that are genetically stable and resilient to stochastic environmental events. Criterion 1 – Maintain a minimum of 40 productive pairs in the AWBP for at least 10 years, while managing for continued increase of the population. Establish a minimum of 25 productive pairs in self-sustaining populations at each of 2 other discrete locations. A productive pair is defined as a pair that nests regularly and has fledged offspring. The two additional populations may be migratory or non-migratory. Population targets are 160 in the AWBP, and 100 each in the Florida non-migratory population and the eastern migratory population. All 3 populations must be self-sustaining for a decade at the designated levels before downlisting could occur. Alternative Criterion 1A – If only one additional wild self-sustaining population is reestablished, then the AWBP must reach 400 individuals (i.e. 100 productive pairs), and the new population must remain above 120 individuals (i.e. 30 productive pairs). Both populations must be self-sustaining for a decade at the designated levels before downlisting could occur. This alternative is based on the principle that with the reestablishment of only one additional population separate from the AWBP, then crane numbers must be higher in both populations than if there are three distinct populations. Alternative Criterion 1B – If establishment of second and third wild self-sustaining populations is not successful, then the AWBP must be self-sustaining and remain above 1,000 individuals (i.e. 250 productive pairs) for downlisting to occur. The Memorandum of Understanding on Conservation of Whooping Cranes, approved by Canadian and U.S. federal officials, recognizes a goal of 1,000 individuals in the AWBP population. This higher number ensures a better chance for survival of the AWBP in the event of a catastrophic event within its extremely limited range. The target of 1,000 is reasonable for downlisting given the historical growth of the AWBP and theoretical considerations of minimum population viability. To ensure sufficient genetic variability, the AWBP must increase to the level where the creation of new alleles through genetic mutation will offset the loss of genetic diversity. After reaching the goal of 250 pairs, the population should gain genetic variation faster than the population loses genetic material. Objective 2 – Maintain a genetically stable captive population to ensure against extinction of the species. 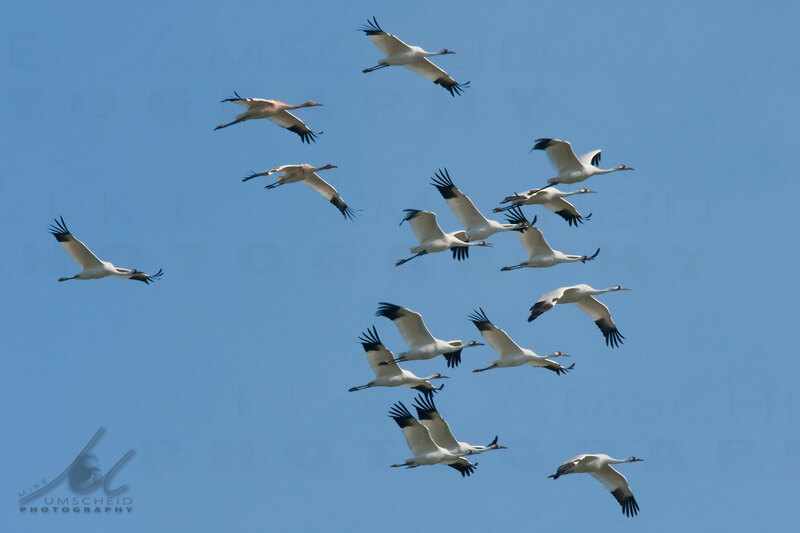 Criterion 2 – Maintain 153 whooping cranes in captivity (21 productive pairs). Genetic analysis suggests that 90% of the genetic material of the species can be sustained for 100 years at this population size (Jones and Lacy 2003). To achieve this, this Plan recommends having 50 captive breeder pairs of whooping cranes by 2010, including 15 pairs at PWRC, 12 at ICF, 10 at CZ, 10 at SSC, and 3 at SAZ. A breeder pair (as differentiated from a productive pair) is defined as a pair that breeds or is intended to breed in the future. Production from PWRC, ICF, CZ, SSC and SAZ will be the principal source of birds for release to the wild for reintroduced populations. However, sources of release birds should be based on the optimal genetic mix to ensure long-term population viability. Delisting criteria have not yet been established because the status and biology of the species dictate that considerable time is needed to reach downlisting goals. In addition, new threats are expected to arise and will have to be overcome before downlisting occurs. Additional information is also needed on the conservation biology of small populations, including a determination of effective population size (Ne) for whooping cranes to maintain genetic viability over the long-term, and impacts of stochastic and catastrophic events on population survival. 1. Continue to build the AWBP and protect and manage its habitat to minimize the probability that a catastrophic event will eradicate this population. 2. Attain breeder pair and productivity goals at 4 captive facilities in the United States and 1 in Canada to produce the birds required for reintroductions. Continue research to improve production of captive flocks. 3. Establish 2 additional self-sustaining wild populations. Continue research to identify appropriate reintroduction sites and improve reintroduction techniques. Protect and manage habitat of reintroduced populations. 4. Continue to use genetic information and advances in conservation biology to conserve flock genetics, and determine Ne and revise criteria as warranted. 5. Maintain an outreach program. Date of Recovery: The estimated time to achieve downlisting is the year 2035. At current rates of reintroduction it takes over 10 years to build a population of more than 100 individuals. These individuals must then reach breeding age (3-5 years) and produce enough young to become selfsustaining for a decade to meet criteria for downlisting. This is expected to take a minimum of 30 years. New information gathered through recovery actions will be incorporated into additional population viability analyses as the population approaches its downlisting goals. Delisting criteria will be established at that time, and the overall recovery strategy and actions will be revised as appropriate. The current budget expenditures needed annually for recovery are $6.1 million (US). The cost through 2010 is estimated at just over $30 million (US) and nearly $126 million (US) through 2035. Photo Gallery Black-and-White Birds: Which Are Cranes? Images copyright Journey North. All Rights Reserved.